The AAG awarded the Gold Medal to Eion Cameron at the 25th International Applied Geochemistry Symposium (IAGS) Official Dinner in Rovaniemi, Finland (August, 2011). I am absolutely delighted to be presenting the AAG gold medal for outstanding scientific contributions to the field of applied geochemistry, particularly exploration geochemistry, to Eion Cameron. Most of Eion’s long and illustrious career has been spent at the Geological Survey of Canada (GSC) as both a research geochemist and as Head of the Applied Geochemistry Subdivision comprising some 32 scientists and technical staff. A major emphasis of Eion’s research has been on the development, testing and application of new and improved methods of detecting ore deposits both at surface and buried at depth. His accomplishments in this area are diverse. For example, he established lake sediment and water geochemistry as an effective mineral exploration tool in Canada’s north. Way back in 1972, Eion carried out the first regional-scale geochemical survey in Canada, sampling lake sediments and waters over 93,000 km2 of the NWT in only six weeks with three choppers and one float plane. Some of the discoveries, as a result, are the Yava and Hackett River VMS deposits. This survey paved the way for Canada’s National Geochemical Reconnaissance Program. Still in the ‘70s he led the first GSC multi-disciplinary multi-agency project – Uranium Exploration in the Athabasca Basin. Through his extensive research globally on the genesis of different deposit types, Eion has developed new rock geochemical techniques for locating lode gold, porphyry copper and VMS/SEDEX base metal deposits. Still on the subject of locating buried deposits, he coined the phrase Deep Penetrating Geochemistry while leading the well-sponsored Camiro project investigating partial extraction signatures of soils at surface 10s or even 100s of metres above mineralisation. I think one of his greatest talents, demonstrated so well in all the publications from this particular work, is his ability to analyse, unravel and describe, in fairly simple terms, processes of complex geochemical phenomena. Just read a few of his many papers (I think they number ~ 200) and you’ll see what I mean. It’s this clarity of thinking that enables him to design a sampling and analysis program that both ensures the fundamental questions will be answered and leads to the creation of new concepts. Other areas where Eion has made major scientific advances are too numerous to mention here but he is highly acclaimed for his ground-breaking research on the sulphur cycle during the Archean-Proterozoic transition, which is critical to our understanding of ocean and atmosphere evolution. This seminal research, published in journals such as Nature, is still quoted extensively today and forms the basis of recent research on the sulphur cycle employing other isotopes, particularly 33S. One of the key factors that has led to such success in Eion’s research is his early recognition that one needs to incorporate knowledge or technology from peripheral fields of study such as soil science, analytical chemistry, statistics, physics, oceanography and microbiology. One of his first actions after arriving at the GSC was to establish a state-of-the-art emission spectrometry laboratory. He fostered the growth of multivariate statistics there; in fact, he wrote one of the first widely available programs for Factor Analysis in the ‘60s. As Head, he always encouraged the acquisition of and research in cutting-edge technology through cooperative projects with such innovative companies as Scintrex and Sciex. 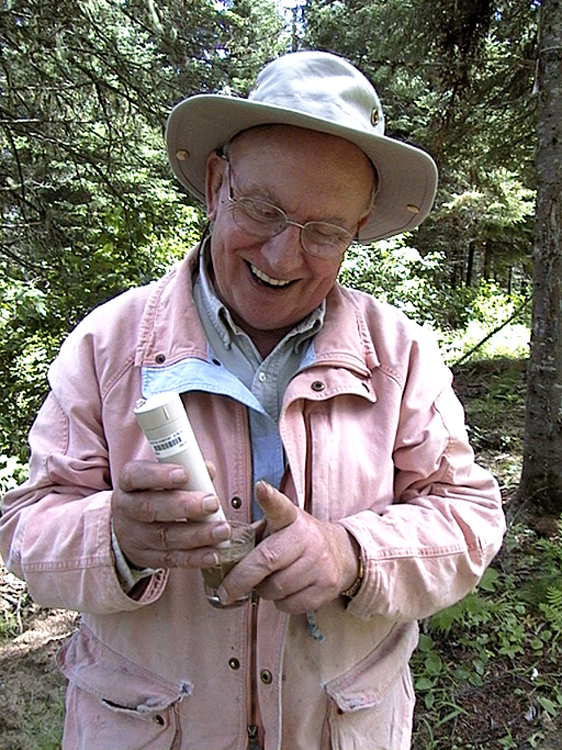 Besides Eion’s many scientific achievements, he has mentored 10 lucky graduate students at theUniversityofOttawa, is a founding member of the AAG (then AEG) and established the Journal of Geochemical Exploration where he served as Editor-in-Chief for 25 years. He has also given much of his time as AAG’s Investment guru, protecting and amassing our coffers during these troubled financial times. So, on behalf of the AAG and the nominating committee of Wayne Goodfellow, Gerry Govett, Matt Leybourne, David Garnett and myself, Eion please come forward and accept the gold medal.